As I wrote earlier, Inhofe produced a somewhat bizarre victory video last week in his war against the environment as the United Nations Climate Change Conference continued in Durban, South Africa. In it, Inhofe sanctimoniously declared himself the victor in what he perceives as a fight between “a one-man truth squad”-that would be him-and cap-and-trade proponents. It was complete nonsense, of course, and, as I’ve long argued, Inhofe can only get away with these types of absurd, political antics because the local, corporate media never challenges him or his ties to the fossil fuel industry. The state’s corporate media outlets, most notably The Oklahoman, seem far more concerned with preserving the right-wing status quo than seeking truth and publishing it. 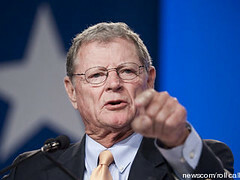 The global warming debate is far from over, despite Inhofe’s pronouncement. By itself, the admission might seem significant. Here’s the largest newspaper in Oklahoma essentially arguing one of the state’s U.S. Senators was not only wrong on an important issue but significantly so because “debate is far from over.” (Note the word “far” here.) So does this mean the editorial writers at The Oklahoman are going to challenge Inhofe on his belief that global warming science is a “hoax”? Hardly. In this standoff, the egotism and smug self-assurance are mostly on the side of the embracers (Boxer and allies) rather than the deniers (Inhofe and company). The editorial point here is that U.S. Sen. Barbara Boxer is the arrogant one, not Inhofe. It’s a false comparison and ultimately not a significant point. Boxer supports the views of the vast, vast majority of the world scientific community about global warming and doesn’t present her evidence in terms of political victory. The editorial is simply perpetuating the Inhofe myth that there’s a controversy over global warming science. There isn’t. The controversy has been manufactured to protect big energy companies. So here’s the editorial’s logic: Well, Inhofe is wrong, sure, we’ll say that, but he’s not as egotistical as people who rationally accept the scientific method, research and critical inquiry so that makes it okay. Knowledge is not important. It’s okay to dismiss science based on political reasons. This is a particularly tragic message to promote in Oklahoma given the state’s low college graduation rate. Why go to college to study when seeking the truth and research and science are simply components of a conspiracy perpetuated by egotistical people? It’s okay to use false or irrelevant comparisons to present an argument. This message sanctions distortions and even lies as a method of argumentation and reasoning. This, too, sends a tragic message in terms of education. It leads to a somewhat prevalent idea here that since religious and political beliefs are morally superior to critical inquiry, they can be presented in less than honest academic terms. The Oklahoman editorial page often argues for the importance of education, but it undercuts that argument when it tries to offer cover in the form of rhetorical subterfuge for someone as anti-science as Inhofe. « On The Question Of Virginity, Or, "Starter? I Can't Make Her Stop!"